At North Strategic, we have created an agency we can all be proud of. Today, I am so pleased to announce that we have another new reason to be proud of what we’ve accomplished together. 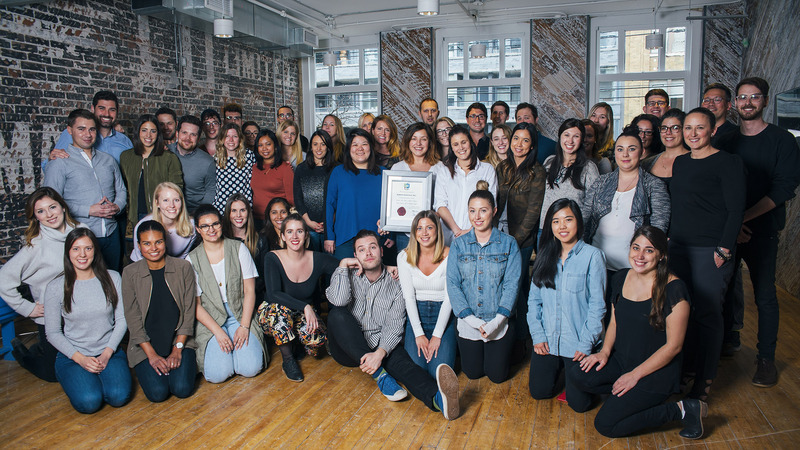 We’ve been recognized as one of Canada’s Top 100 Small and Medium Employers for 2017. This is a win that truly belongs to the entire team. In all my years working in the HR profession, I have never seen a more positive, engaged, and motivated work environment. People here truly love one another. As family. As friends. As incredibly talented team members. Every day, I am inspired by the mutual respect and level of admiration this team has for each other. So how do we do it? We follow a very simple formula for fostering our best place to work environment. At North, we spend a great deal of our time benchmarking ourselves against other agencies in Canada while making every effort to provide the best possible culture for our employees. From the most amazing career experiences, where we focus intently on providing constant opportunities to grow, to our highly-specialized training and development programs and formalized mentorship opportunities, we are investing heavily in the development and well-being of our people. Not to mention the best office environment, incredible team off-sites (we took our entire team to Barbados last year! ), and highly competitive compensation, bonus, vacation, and benefits packages. Our Co-Founders, Justin Creally and Mia Pearson are unbelievably passionate leaders who care deeply about our employees and foster an environment of mutual respect at all levels. They work as closely with our junior team members as our senior team and take no notice of titles, age, or seniority. If you have a voice and an opinion, they will listen. And they expect the same of all those around them. Our teams are united, with everyone working towards the same end goal, which is to provide our clients with outstanding results in PR, social media, and content creation. Our hiring process is rigorous and there’s a reason for that. We want only those on our team who are highly committed to working together as a team. We all strive to do our very best and contribute in ways where everyone wins. At North, we live according to an established set of core values called The Compass, and all of us, at every level, are evaluated against our commitment to those values. There’s a certain kind of magic here at North where everyone believes that success is always possible from a client, company, and team perspective. We are eternal optimists and work together to make wonderful things happen as we navigate through our day. We are building our future together and constantly looking ahead to learn more about how we can become an even better team, culture and company. We are building a culture of trust, one where people are treated as mature adults and are free to come and go as they please. If the work is getting done and results are happening, we believe that everyone wins. We led the way in abolishing the outdated idea of the time sheet, a move that was unheard of in the agency business, but we did it to ensure that our people could contribute in ways that are meaningful to them – and not simply focused on generating revenue. There is no other agency in Canada that is better known for retaining its employees and with that, we have built an amazing reputation as being the very best agency to work at in the country. Our turnover rate was less than 3% over this past year, which remains the lowest in the business, and we work very hard to keep it that way. With these core philosophies as our guiding principles, it is no wonder that we find ourselves in the celebratory position. At North we are proud yet humble, strong, and kind. I am so proud to be part of this team and can’t wait to see what successes our next five years will bring.